Former British PM says anti-Semitism in the Labour party is a "truly shameful episode". Former British Prime Minister Tony Blair on Sunday accused Jeremy Corbyn's Labour party of doing a "terrible thing" by alienating the Jewish community. 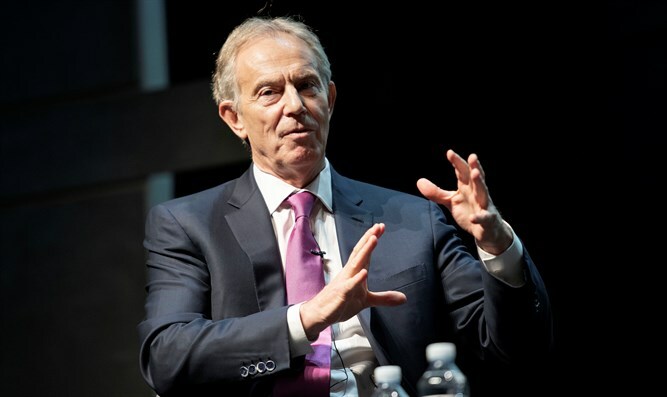 Blair said Labour's crisis over anti-Semitism was a "truly shameful episode" for the party, in an interview with Euronews quoted by The Jewish Chronicle. He appeared to blame Corbyn's "statements" for contributing to the problem and said there was "an element to his leadership" that was at odds with the party's anti-racist principles. "But,” he added, “his statements and the way the party have handled this... It really doesn't matter if I call him that or not." "This has been a truly shameful episode for Labour and it's causing real difficulties for those of us who stay in (the party) and want to see it come back to sense; to see a situation in which the Jewish community in this country feel really alienated and worried and anxious... that's a terrible thing to have done," said Blair. Asked whether he thought Labour was now racist, Blair replied, "The party that I know and that I grew up in is definitely not a racist party." However, he added there was an "element to this leadership" that was "very difficult to reconcile with the proper principles of the Labour party." Corbyn, who has, in the past called Hamas and Hezbollah his “friends”, continues to be plagued by incidents of anti-Semtism and anti-Israel statements. The Daily Mail recently published photos of the Labour leader at a cemetery in Tunisia holding a wreath near the graves of some of the Palestine Liberation Organization (PLO) terrorists who were responsible for the massacre of the 11 Israeli athletes at the 1972 Munich Olympics. That week, the Times of London published a picture of Corbyn meeting with the leader-in-exile of the Popular Front for the Liberation of Palestine (PFLP) terrorist organization, only weeks before its members carried out an attack on a Jerusalem synagogue in which six people were murdered. Later, it was revealed that Corbyn attended a conference with a convicted Hamas leader who was jailed in Israel for his role in orchestrating a string of terrorist attacks that killed more than 100 people between 2001 and 2002. Last week, the Daily Mail exposed remarks made by Corbyn in 2010 in which he hinted that Israeli officials were controlling the speeches made by British MPs. Moreover, dozens of Labour members have been suspended over their anti-Semitic statements in recent years, and the party has been criticized for its failure to deal with the anti-Semitism within it. Labour has also come under fire for its refusal to adopt all the examples in the International Holocaust Remembrance Alliance (IHRA) definition of anti-Semitism, though the party’s ruling body is expected to convene on Tuesday and decide whether to adopt all examples. Blair's comments came after another former British Prime Minister, Gordon Brown, gave a speech at the Jewish Labour Movement conference, in which he urged the party to adopt the IHRA definition of anti-Semitism. "We must never allow ourselves to be... the problem rather than the answer to the problem in the future. So I want to say to you very clearly today that the International Holocaust Remembrance Alliance definition of Semitism is something that we should support unanimously, unequivocally, and immediately," said Brown.